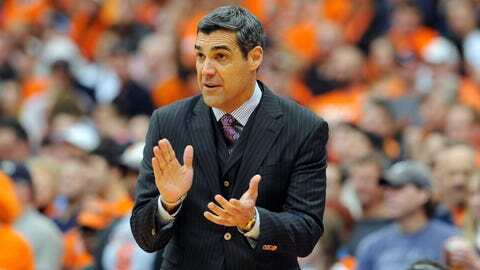 Villanova coach Jay Wright is looking for a big year from his Wildcats. We’re finished with the first week of conference play in the new Big East. In the way of thinking of sports journalists everywhere, that means it’s officially "time to draw semi-informed conclusions about how this conference will look in March." Here’s one conclusion: Things will change by March. A lot. They always do. Remember January 2013? Nerlens Noel and Kentucky were surging and looking to re-enter the AP top 25 (but later missed the NCAA tournament). Minnesota was ranked in the top 10 (though head coach Tubby Smith was later fired). And the new Big East Conference was just an idea called the Catholic Seven. So realize that any conclusions drawn in January are really only educated guesses. And will usually turn out to be wrong by March. But after New Year’s Eve kicked off conference play in the new Big East, we can make some pretty educated guesses about how the league will play out this year. My overall take? This is a deep conference – maybe not as deep as I’d originally thought, with talented teams like Providence and St. John’s stumbling into conference play at 0-2, but still a conference that ought to fill commissioner Val Ackerman’s stated goal of at least five NCAA tournament bids. It’s also a conference without one team that appears in a different class than the rest, like Arizona in the Pac-12. I spent New Year’s Eve hanging out with host Rob Stone and analysts Austin Croshere and Tarik Turner, both former Big East stars, at the FOX Sports 1 studio, breaking down every game, and have kept close tabs on conference play since. — Villanova’s early success is sustainable. The Jay Wright-coached Wildcats have only one loss – a pretty darn excusable one, at second-ranked Syracuse – and opened Big East play with a thrilling overtime victory against Butler at Hinkle Fieldhouse. As a wise man once said, this team has some serious onions. ‘Nova has two overtime victories so far this season, plus a paradigm-shifting win in November over the ridiculously talented Kansas Jayhawks. Wright told me his guys enjoy playing in the spotlight – remember last season, when Villanova beat Syracuse and Louisville, both top-five teams that eventually made the Final Four, in the same week? – but his challenge is to keep getting them to play with consistency. So far, so good. The Wildcats are small but mighty, with a lineup that can march out five perimeter players who score and share. Six players on this team are averaging more than eight points; four are averaging more than four rebounds. They shoot a lot of threes, and they turn you over on defense. If this team is making shots, that sounds like a recipe for March magic. — I still like Creighton to win this conference. The doubters – a.k.a. those who didn’t understand the very Big-East-y character of Creighton’s former conference, the Missouri Valley – wondered how Creighton would adjust when the westernmost Big East school started playing with the Big Boys. The Bluejays have a Euroball approach: great ball movement, even better shooting, attempting a higher percentage of 3-pointers than all but five teams in college hoops, according to KenPom.com. Does Euroball fly in the new Big East? Early returns indicate yes, with two resounding victories (over Marquette and Seton Hall) to open Creighton’s conference schedule. I spoke with coach Greg McDermott last week, and he emphasized how much this team has improved on defense. Some more KenPom stats: Two years ago, Creighton was 190th in the nation in adjusted defensive efficiency. Last year, 80th. Now, 47th. Add a solid defense to one of the nation’s most efficient offenses and watch out, Big East. The improvements on defense come from an experienced team that’s learned to play together, McDermott told me. — Xavier is the third team I think can win this conference. (I’m not on board with Georgetown — yet – taking a wait-and-see approach there.) Those were two convincing wins to start Big East play, against St. John’s and Butler. Xavier fell off most of our radars after a miserable Battle4Atlantis trip in November, when the Musketeers dropped three in a row to Iowa, Tennessee and USC. But Xavier has perhaps the top NBA prospect in the Big East in point guard Semaj Christon, plenty of depth and the best front line in the conference. — Grant Gibbs is the top glue guy in the Big East. Sure, Doug McDermott is the best scorer in the Big East, perhaps in all of college basketball. But Creighton has to get the ball to him. And no one is better at that than the 6-foot-5, sixth-year point forward. Gibbs and McDermott played for the same AAU program; their chemistry goes way back. When these two are on the court together, you feel like they are on a different wavelength than the rest of the players. I asked coach Greg McDermott what makes Gibbs so special. He told me that Gibbs, who leads Creighton in assists per game, is the type of player who will make a great head coach someday: He has a high basketball IQ, is a great leader and has incredible court vision. He can pass the ball with either hand, feathering it or rifling it to the right spot. Dougie McBuckets gets the headlines, but Grant Gibbs gets it done. — Brandon Miller is my early pick for Big East coach of the year. Yes, Butler is 0-2 in Big East play, with a tough home overtime loss to Villanova in the opener and a road loss to Xavier. But did anyone ever think Butler would enter Big East play with only two losses (one-possession defeats against Oklahoma State and Louisiana State) after losing coach Brad Stevens to the NBA and top all-around player Roosevelt Jones to an injury? I sure didn’t. To me, the definition of "Coach of the Year" is exceeding expectations, and that’s exactly what Miller has done. I asked him how the Bulldogs have done it. He said it’s by being in every game at the end and by continuing the "Butler Way" — selfless basketball that emphasizes 40 minutes of fundamentals over individual highlights. It’s worked so far. If this team even sniffs the NCAA tournament, I’d consider it a huge success for Miller and the university. The margin for error, however, is razor thin. — Providence is in huge trouble. I was talking to Croshere, a Providence great, about Ed Cooley, and he told me the third-year coach is absolutely beloved by the fan base and the university. Cooley is likable, heâs real, he connects with his players, he recruits the hell out of his situation, and he’s brought the Friars back to relevance. He’s also leading a team with a three-game losing streak (including a crushing double-overtime conference opener to Seton Hall), his point guard Kris Dunn is out for the season with an injury, and two highly recruited freshmen were recently suspended for the season. (One of those freshmen, Brandon Austin, has elected to leave the program.) This is after last yearâs fiasco with Ricky Ledo, who didn’t play a game in a Friars uniform. Bryce Cotton has been an absolute hero for this team, doing it all, stepping up at point guard and playing the most minutes of anyone in the conference. He can’t do everything, though. Itâs fair to wonder when Cooley’s impressive recruiting will begin to pay off. — St. John’s isn’t going to be able to make it work. One Big East coach said it best when he told me he thinks St. John’s might have the most talent in the conference â but those pieces just don’t seem to fit together. That has been on display in the Red Storm’s first two league games, losses to Xavier and Georgetown. This week, the Red Storm hosts Villanova, a tough matchup that could mean an 0-3 start for a promising squad. I like this team a ton â its coaching staff, its talent, and its likable players, none more than dynamic scorer D’Angelo Harrison. This is the type of squad that could lose its first three then tear off a 10-game winning streak. You get a sense that if St. John’s finds its flow, it’ll be hard to beat. You also get a sense that it won’t find that flow. — Seton Hall is going to put up a fight. Last season, Kevin Willard’s team was a Big East bottom-feeder, going 3-15 in conference play. This season, despite a rash of injuries, Seton Hall is, at the very least, competitive. It beat an ACC school (Virginia Tech) and an AAC school (Rutgers) and narrowly lost to a surprisingly good Big 12 school (Oklahoma). The Pirates beat Providence in two overtimes in their Big East opener. But there have been just so — many — injuries. Four of their five starters have missed games. Sterling Gibbs is a serious scorer, Fuquan Edwin is a great all-around player, and Jaren Sina is a talented freshman point guard. But this year feels like a wait-for-next-year type of thing for Seton Hall, when Willard is bringing in a top-10 recruiting class. — Big East coaches keep telling me Marquette will turn things around. This is still a rock-solid defense. I believe in Buzz Williams — but only when he figures out his point guard situation. And that doesn’t seem like it’ll happen any time soon.